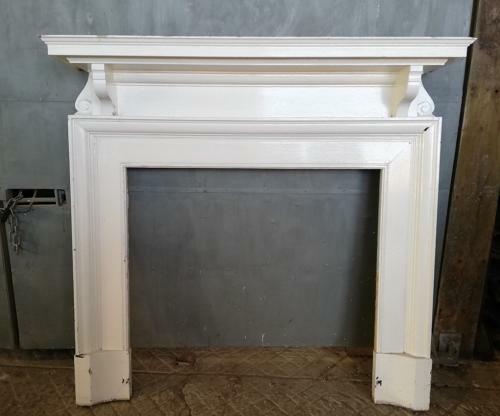 A large elegant Edwardian pine fire surround suitable for use with a wood burner or fire basket. The fire has an attractive period look with carved corbels and scrolled detailing under the mantel. The fire edge has a raised moulded border and the feet are thick and chunky with a simple curved design. The fire has been painted but will need to be stripped and refinished by purchaser to suit. The fire is of a good size, ideal for a living room, and is very well made. The fire is antique and has some slight signs of wear and age. There are some chips to the paint and small knocks, scratches and marks. One of the mantels corners has a small amount of damage and there are some further knocks and chips, especially to the base of the feet. We can restore and prepare the fire for use at an extra cost. Please contact us for details and a quote. The fire is a very attractive and well made item with a great deal of period charm, ideal for adding character to a period home.